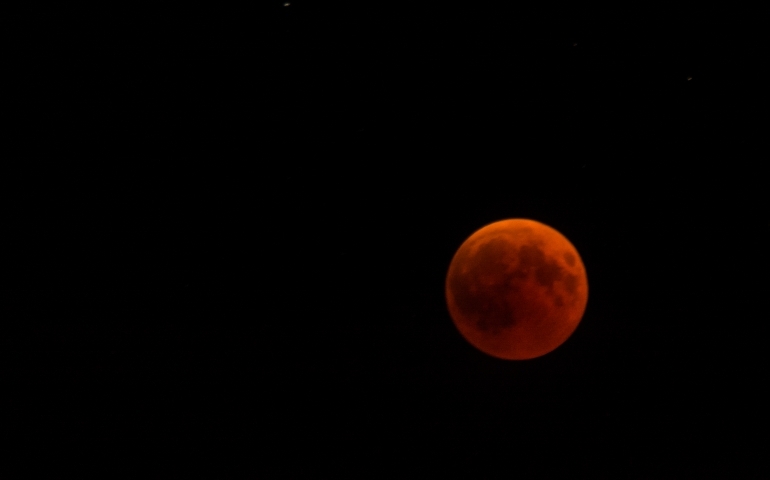 In the late evening of Jan. 20th to the 21st there was a total lunar eclipse over North America. This eclipse is also known as a Super Wolf Blood Moon. A super moon is a full moon at its closest approach to earth appearing slightly larger than usual. A blood moon is when there is a total lunar eclipse where the entire moon appears red because it is directly behind the earth’s shadow. The sunlight reflected off of Earth’s atmosphere is what emits a red color over the moon, the same way the sun looks orange and red at sunset or sunrise. The eclipse does not happen every month because the moon’s orbit is at a 5 percent tilt. Scientists do not know how this happened, but they believe it had to do with the formation of the moon when another planet-sized object collided with earth during the early life of the solar system. As the eclipse began, parts of the full moon darkened. It looked like all the phases of the moon happening in just a few hours. Once half the moon was behind the Earth’s shadow, the dark area began to turn orange. The red color could not be noticed until the majority of the moon was in the planet’s shadow. The last lunar eclipse over North America was on January 31st, 2018 during the predawn hours. This Sunday’s eclipse started in the late evening at around 10 pm. Those with clear skies were able to see it easily as its peak time was 12:16 am EST 11:16 pm central time). Totality lasted 1 hour and 2 minutes, but all the phases of the eclipse took place over a period of 3 hours and 17 minutes. The weather channel predicted partly cloudy skies this same evening in the Oklahoma City area. Depending on the weather when the event took place, some students got lucky and saw the full eclipse from the SNU campus!